everything seams good. still our fathers are doing what we have been waiting for so long. dear fathers You should know that we all Your children are with You. our fathers, May God be With Us!!! Our Holy synod is still moving forward with oustanding energy. Thank you God. Has Abune Paulose signed on the minutes? what will happen if he insists on not signing off? This is what I want to know eagerly. Tiru newu mechem ye Abune kewestos tehitina yemiyasdenik ena tehut abatem endalen yasayal. honom sera libezabachewu yemichel bihonem 2 hageresibket siyastedaderu gin betam yeteshale ena tiru amarach newu enes esachewum embi belewu aschegari neger endayifeter segat neberegn.Eskeginbot deres belewu ketekebelu abatachin keginbot bohalam amlake min endemiyasasebachewu man yawukal tesfa korten balenebet yegziabheren dink serawun semonun selayen eskezawu egna enetseley yihenenes man ayebet lemanegawum amlak yetemesegene yiihun . It seems like Abune QewosTos will have lots of responsibilities on his hand, let God help him and give him the strength to endure this heavy task in his old age. Yet I am really proud of how our fathers have been coordinating and abiding to one another’s views and directives and was also willing to take low place and be compliant to the Laws of the Church. The Fathers and the laity have gone through enormous amount of tribulation but were able to wait with perseverance for such day to come. But I believe that we still have more expectations and more things to do. 1.The talk was done now we need the walk – the practicality of the decisions taken in this meeting starting from the demolition of the Statue of Humiliation which has made the laity lower their heads in shame leaving them wordless on how to react or respond to such non-Christian act. 2. As the Holy Synod has started to clean up the offices at the supreme governor level, those hired through special interest and blood relations, it should go all the way to the province and parish level and clean up all those personality cults who come with their suit cases once a month to collect the alms of the poor follower. 3. And the Elders who are assigned to bring the fathers of the two sides together should be able to give more determination and commitment to bring this to an end. They should restrict to only guiding their directives with open mindedness and forgiving heart and according to the constituent of the Church laws and only the Church laws. Egizabher yimesgen temsegen lebel enji min elealhu temsegen temsegen temsegen. ሁሉን በፍቃድህ ያደረክ ጌታ ክብር ምስጋና ይግባህ! We have seen God's job by our necked eye. He is always together with our Church. Trust him, any body can say what ever. But he has shown his hand. Thank to God forever. The "Nebure Eid" is koftana. I hope he may lead Addis Ababa Diocses. For any, change is good for you-the trouble makers. EGZIABHER YIMESGEN.Gimarow dess yilal fitsamewun yasamirlin.Endih newu.SEWU ZIMMMMMMM SIL EGZIABHER SIRAWUN YISERAL.Ahunim zimmmm bilen ENITSELIY. 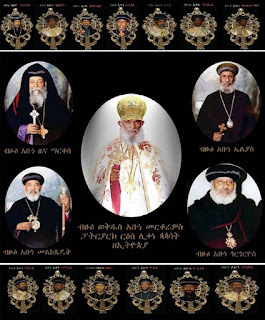 For those bishops like Abune Gabriel Timothewos, Nathanael, Kewstos, Gerima,Athanatewos, Elsa..., who are elders and know what happend 19yrs ago, it is a matter of legacy to bring the EOC members together once and for all. I think the issues of statue, diocese allocation, Abune Samuel or Abraham are very minor ans insignificant compared to what they are doing now. I applaued those elderly bishops like Nathanael, Timothy Mathias Gabrael...for their courage and showing leadership. This is great! We have been getting positive news in the past six or days now, and i almost feel the past is gone with the wind. However, deep inside in my conscience i am aware that as long as the Fathers fail to held those individuals who have been threatening the very existence of our church accountable made them sure pay for the consequences, then our celebration wont last very long. Think about it, in the past six day the Synod has been dealing with the wrongs that has been done to the church and her followers by the Patriarch and his cronies. Almost in every single counts, Aba Paulos has been found guilty of not only abusing his power(dictatorship) as a Father but also involved himself in a crime that could put him behind bars if he were to be tried in an independent civilian court. Then, what reasons the Synod can give us when we raise the question why is he still a Patriarch? 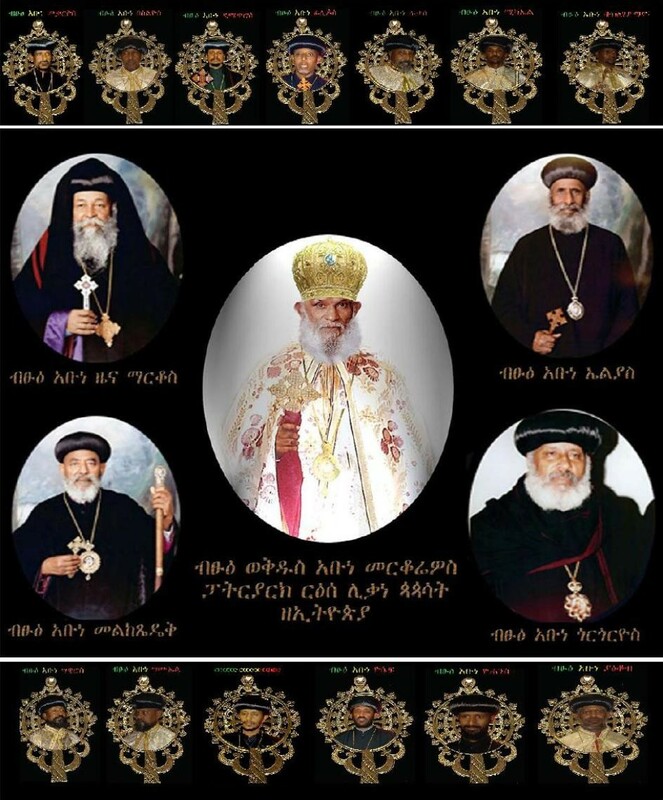 I hope the holy Synod isn't naive enough to expect Abune Paulos will somehow redeem himself by willfully relinquishing the patriarchate position that he has no the spiritual and intellectual capacity, moral integrity, and most importantly the required innocence to hold the power and lead the church. He has proved inadequate, corrupt and failure to manage the church's interests and lead her followers. We don't have confidence in him as a Tera christian let alone as a Patriarch. Therefore, i say, if the Synod truly want to solve the churches problems, then start from the root cause, the patriarch. By the way, what happened to our Holy Father Abune Qerilos? I haven't read his holiness's name in any of Deje Selam's recent reports? Did he not returned from his medical visit to Greece? Abune Kerlos has been sick this past week, and we will come up with a report about his health as soon as we can.